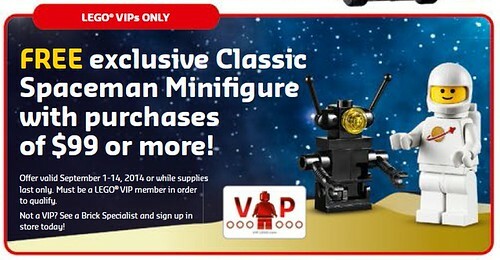 The main promotion will be a Classic Spaceman Minifigure with purchase of $99 or more. This promotion will also stack with the LEGO Legends of Chima Worriz’ Fire Bike promotion. On September 17, LEGO Creator Santa’s Workshop (10245) will be available to VIP members. This is the latest edition to the Winter Village subtheme. •On September 17th, VIP members will have early access to LEGO Creator Santa’s Workshop (10245). his is the latest edition to the Winter Village subtheme.